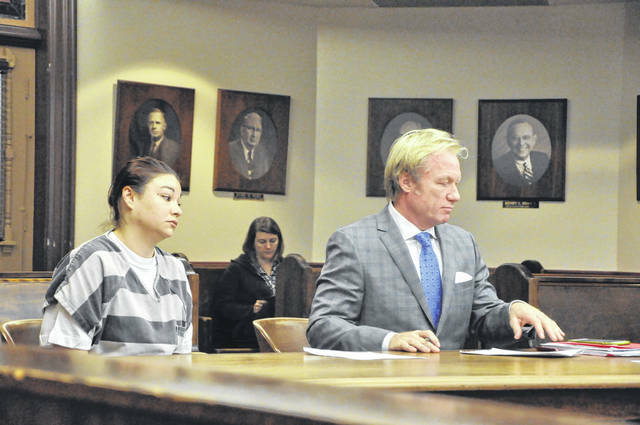 Alana Hissong appeared in Delaware County Common Pleas Court on Wednesday morning with her attorney Dominic Mango. An October trial has set for the woman who allegedly stole items from the Tanger Factory Outlet mall before she fled from police, knocking over a deputy, and later crashing her vehicle. Alana Marie Hissong, 28, of Blacklick, Ohio, appeared in Delaware County Common Pleas Court Wednesday morning and entered a not guilty plea to one county of robbery, a second-degree felony; one count of failure to comply with an order or signal of police officer, a third-degree felony; and one count of operating a vehicle under the influence of alcohol or drugs, a first-degree misdemeanor. Delaware County Common Pleas Court Judge David Gormley scheduled Hissong for trial on Oct. 31 and set a pretrial hearing for Oct. 23. Assistant County Prosecutor Amelia Bean-DeFlumer alleged that on Aug. 8, Hissong stole items from a store at the Tanger Factory Outlet and then fled the scene in her truck, knocking over a deputy. Bean-DeFlumer said that Hissong eventually crashed her vehicle at Berkshire Road and 3Bs & K Road. The Delaware County Sheriff’s Office previously reported that after Hissong knocked over bike Deputy Josh Clarke, a second deputy, Alex Richison, believed that Hissong was moving her vehicle to strike Clarke while he was on the ground and shot out her tires with his sidearm. Clarke suffered only minor injuries in the incident and Hissong was taken to Grady Memorial Hospital for treatment after she was arrested. Bean-DeFlumer said Hissong also has a forgery case ongoing in Licking County and a felony drug case in Warren County. Gormley set Hissong’s bond at $20,000 and said she could be sentenced to up to eight years in prison for the robbery charge, 36 months in prison for the failure to comply charge, and up to 180 days in jail for the OVI charge. The day after the incident, Delaware County Sheriff Russell Martin said the Bureau of Criminal Investigation would be conducting an independent investigation into the shooting. The sheriff’s office reported on Monday that the BCI investigation is still ongoing.